Sharper, warier, just plain smarter than the rest. Far too smart to be suckered in by the corral and the cattle trailer. Oh no, sure looks like a bad end could come of that. This weekend it was time to take the cattle out of the pasture for the winter. This involves driving the herd into the corral, slamming the gate shut and shunting them onto the waiting cattle trailers, load after load, until the last one is gone. Persuading the cattle out of the wide open field into the corral is the tricky part. For weeks, hay and treats were strewn inside the corral so that they’d get used to stepping in for a nosh and ignoring the high, enclosing walls. After all, the gate was always open, wasn’t it. So the day came with a number of portable metal stock gates hooked together to guide the cattle into the corral. After a drought-stricken summer, the animals come running when called to get the bale of hay feeding them in lieu of the nonexistent grass. Sure enough, they came out of the cedars and, with a bit of urging, ambled obligingly into the corral and were shut up. Now the maverick is pretty well always a cagey female who has no problem at all peeling off from the herd and taking to the trees when the herd is being herded. Often, she has a calf by her side and teaches the calf her own independent ways. She is the bane of farmers and can be practically impossible to corner and capture. The more riled you make her, the faster and dodgier she becomes. Some farmers have become so enraged with this perversity that they finally resorted to a shotgun to end the fugitive’s defiant run. No, we’re not going into that corral no matter how much you chase us. The maverick this year was a brash red cow with a half grown offspring trotting to her heels. The rest of the herd milled in the corral. Two large cattle trailers waiting to start taking on their load. Everyone watched as the cow and her calf dodged this way and that and would not be tempted into the enclosure no matter what bribery was offered. Exhausted herders ran to head her off, then ran again as she outflanked them, then bent over wheezing and panting as the cow and calf headed for the back of the field, the urge for freedom proving far stronger than any instinct to stick with the herd. 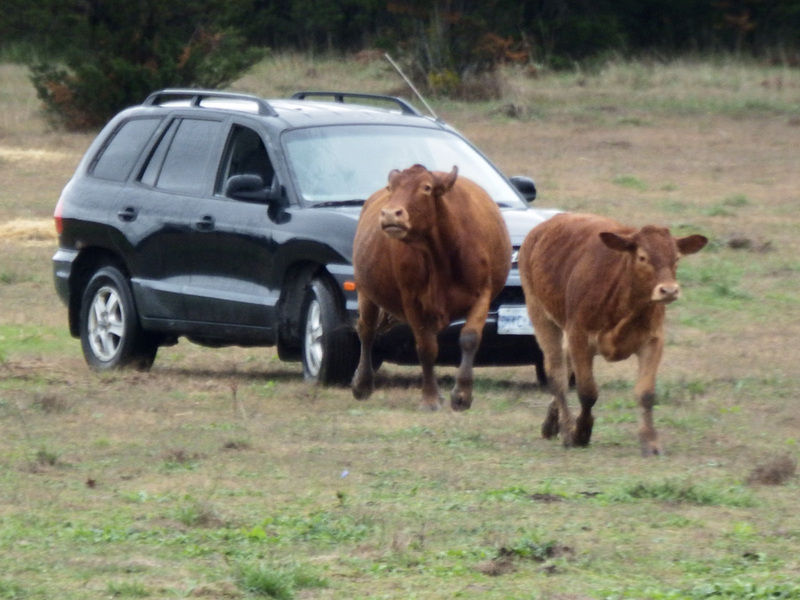 The herders took to their SUV which could outrun the cow but not make her stay in front. Again and again the fast vehicle got ahead of them and headed them off. Again and again the red cow and her offspring simply turned aside and headed for the cedars and rough ground again where they had the advantage. With impatient cattle trailers waiting, the herders finally abandoned the chase. 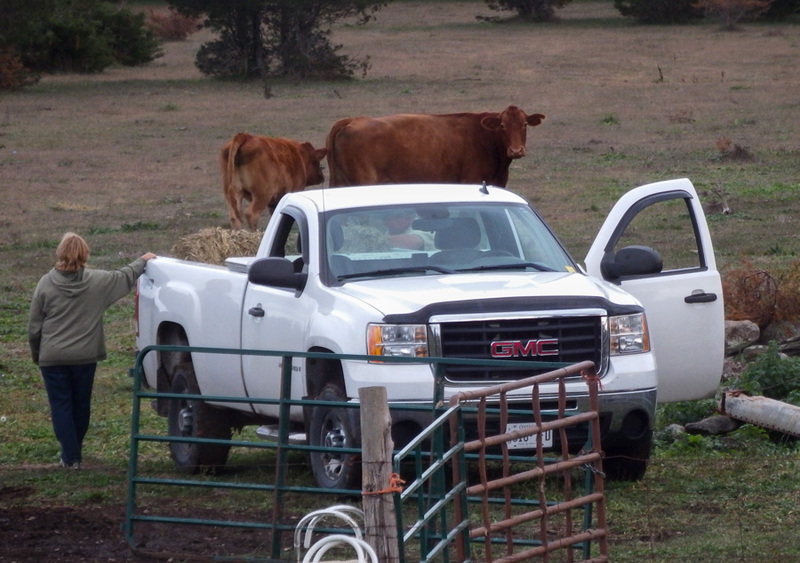 The rest of the afternoon was spent loading and moving the cattle in the corral. Nope, treats in the back of the truck won’t work. You know where you can stuff them. Only when they were all gone did the herders return. Not only were the dark cow and calf hard to see in the brush but they no longer had the pull of the rest of the herd to tempt them near the corral. Capture now required a different strategy. The cow and her calf had had ample time to cool off, perhaps even time to forget why they had been so riled earlier. The white pickup, used to deliver hay through the drought, drove slowly into the field and stopped. The herders called, as they always did when bringing day. “Co’bos, co’bos, co’bos,” echoed out, carrying it’s message of bovine munchies, a call that always brought the herd running. Sure enough, the red cow and her calf emerged from the woods and trotted up to the back of the truck and tucked into dinner. Slowly, every so slowly, the truck began to inch toward the corral, the two animals following, their noses buried blissfully in the hay. Won’t be one of that soft headed crowd. It worked a treat–until the truck began to crawl through the cattle gates surrounding the corral. The red cow’s head flew up. No way was she falling for this old trick. She and her offspring turned their backs and briskly sauntered off in the opposite direction. No more would they come near the truck no matter what was offered them. Last I saw was the pair vanishing into the cedars. The weary herders slammed the tailgate shut in defeat and gave up for the night. My sympathy went out to both sides of the game. Not getting into that thing either. Of course the red cow and her calf will eventually be captured somehow and shipped to join their fellows. They can’t spend the winter in the bush. And the trip isn’t to the slaughterhouse, only to a barnyard with food and shelter for the cold season. If she’s lucky, the red cow will be back in the spring with a new calf to learn her ways. If she’s not, if she’s caused too much annoyance and frustration, she will not be seen again. Hence my theory about the constant human assault on herd intelligence, be it cattle, sheep, goats, pigs, horses, whatever. The maverick is the one just a bit brighter, wiser, shrewder than the rest. So she is the one who causes the most inconvenience to the farmer, disrupting routine, fighting orders, spotting the weak spot in the fence, refusing to obediently submit. Ergo, which animal is the farmer going get rid of first — that *#@*%$ contrary troublemaker. Oh yes, she’s going to meet her Waterloo just as quick as he can send her. And by doing so, that animal’s superior intelligence is removed from the herd. It cannot be passed on to improve the collective brain power. This is selective breeding — downward. No doubt this has been going on since animals first became domesticated. While I can’t blame a furious, exhausted farmer who has been outwitted once again by a gate-opening sheep or a cow that hides deep in the woods, I can’t help but wonder how astonishing these domestic animals would be now if only we hadn’t spent thousands of years knocking the brainy ones out of the mix. Previous Previous post: Another Accident in My Yard. Speed Demons Plague this Rural Corner. Next Next post: Discovering the Local Photo Club. An Excuse to Mess About with Photoshop.